After liberating himself from the Drive-By Truckers five years ago, Jason Isbell set about proving that he's a master storyteller, be it in Twitter-size nuggets or song form. He sidesteps country clichés even when he's singing about heartbreak, his daddy or loneliness. And Isbell has a sense of humour about his penchant for introspection, turning the reins over to his drummer after a few songs, saying, "I get tired of my own whining." It wasn't a set of massive surprises, but the moments were no less revelatory, weaving material from his Truckers days ("Decoration Day," "Outfit," "Goddamn Lonely Love") with his most recent album, Here We Rest, and its mournful closer "Tour of Duty." 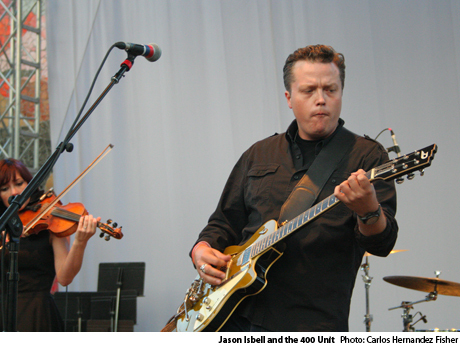 Jason Isbell and the 400 Unit "Hope the High Road"